The Conversation is a film that uses sound to drive the story. Walter Murch handled mixing duties and Art Rochester worked as the sound engineer. Each were early in their careers, having about 10 years of film experience between them. Their work complemented the score composed by David Shire and helps the audience connect with the characters. The audio works as a pulse for the film, escalating individual moments and giving life to the action. While it is a film with clear, discernable characters, the use of audio from the production side gives the audience a stronger feel for the characters. 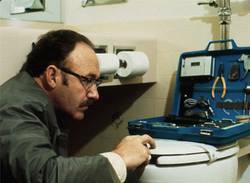 Gene Hackman plays Harry Caul, a wiretapping specialist working in San Francisco who is contracted to record private conversations for clients whose reasons he does not explore. His character creates his own tools and modifies others to his specific need(s). Though he has people with whom he works, his character is secretive and plays everything in life close to the chest. The film opens from a far shot and locates Hackman’s character walking through a crowded urban area. The introduction reflects the process of spying, which is basically the subject of the movie. His profession requires a seemingly subtle field approach and patience. What lies beneath is the aggressive nature required to follow people, and the complex components at work that maintain a high quality recording. Caul carries an escalating level of tension internally throughout the film as he becomes overwhelmed with the content in a particular recording. The element of sound as they relate to filmmaking increases in prominence as Caul’s stress levels rise. From a filmmaking perspective, the general audio of the film increases in intensity as Hackman’s emotions break through his character’s walls. The audience is given a look at Caul’s personal life during a brief pass by a lady-friend’s apartment. In an awkward conversation, the woman describes his unique way of opening the door. The idea of a door’s sound being tied to the person opening it is interesting if you think about your own way of opening a door, or walking, or coughing, etc. Hackman’s character delivers a superb line in the film while on the job. He asks another character “since when are you here (hear) to be entertained?” This could be a very interesting tag line as well: a cerebral piece of commentary aimed at the viewer, but said to drive the action, not break the fourth wall. David Shire composed the score before the movie was shot. Though it is composed of piano music, Shire also distorted some sections to create additional tones that were unique to that distortion. He utilized a form of musique concrète derived from electroacoustic music. It is a form of expression free of law, and bound only by the creator. If you watch a lot of films from the 1960s and 1970s, San Francisco is a wonderful setting, and photographed well in those decades (see Bullitt). Choosing San Francisco during this era gives us a look at something that will never be again. The city of San Francisco is a setting that works for many stories and is a great aspect of The Conversation. The Conversation uses the science of sound and audio post-production to tell a full, intense story and received an Academy Award nomination in 1974 for Best Sound. It explores the application of sound in the story and the production. The moments where audio emphasizes character actions are also effective in conveying character emotions. Audio mixing gives the story in the film more clarity and depth. Posted on Feb. 17, 2013, 4:34 p.m.
Posted by BJ Rochinich on Feb. 17, 2013, 4:34 p.m.